A cross between the traditional photo booth and the modern “selfie,” a franchise is making its way to Richmond for the first time. 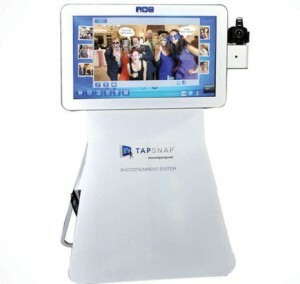 TapSnap claims to be the latest, greatest “phototainment” experience and, as it’s portable, can be rented to appear at almost any party or social event. “Guests at events with TapSnap are always astonished at how we’ve reinvented the photo booth,” said Leigh Matheson, an Australian native turned Canadian businessman, who runs the local TapSnap franchise. The photos combine with a responsive touchscreen technology, along with sharp, computer-generated backgrounds, wacky digital doodles and virtual props that can be added to the photos. It works via a professional grade camera, perched on the side of the oversized, vibrant flat-screen, which then captures candid moments or carefully composed portraits. People getting their pictures taken can share their creations via popular social media networks instantly, and broadcasting live photo, video and social streams at corporate events, charity galas and personal celebrations such as birthday parties and weddings. Launched in mid-2012, TapSnap is based in Vancouver, with nearly 100 franchisees throughout North America. Source: "Smile, you've just been TapSnapped." Richmond News, August 7.